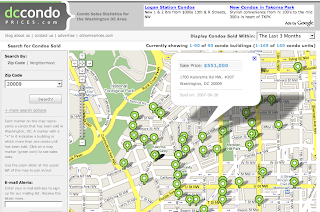 I uploaded data for 769 sales recorded by the District in July to DCHomePrices.com and DCCondoPrices.com last night. The two outliers I mentioned earlier, the $88MM home in Glover Park and the $33MM Kalorama condo, aren't in the Recorder of Deeds database yet so I've excluded them until I can determine the correct sales prices. I'll post an analysis shortly. Condo Price Cuts: Through the Floor?